Is Ogopogo real? Incredible sightings in Lake Okanagan, British Columbia, Canada! 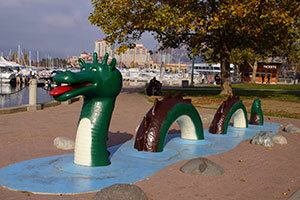 IS THIS OGOPOGO BRAVING THE COLD? February sighting during Kelowna cold snap! Although there have been a steady number of reports of "sightings" over the year, the Fall of 2018 saw a lot of excitement around the Kelowna area as many people all reported seeing what could certainly be the elusive creature of Lake Okanagan all at around the same time! Read more about these experiences! Lake "monsters" have been reported by thousands of people over the years in all parts of the world. Do they really exist? Is there a plausible explanation? Have some few prehistoric creatures somehow managed to survive the ages where most became extinct, but such that a handful still thrive in modern times? How does a legend like Ogopogo start? It starts with sightings of something unexplainable. Over the past several centuries, countless people have claimed to have seen what they believed to be Ogopogo or N'ha-a-itk (the original name by which it was known by local native inhabitants of what is now the Okanagan Valley of British Columbia, Canada). In modern times, there have been several photos taken of this anomaly. All these reports certainly lend credence to this so-called "legend". Click here to read about many of the reported sightings. Scientists have put forth the theory that unlike the world-renown "Loch Ness Monster", nicknamed "Nessie", the Lake Okanagan "resident" is probably a form of primitive whale, Basilosaurus Cetoides, which tallies almost exactly with the loglike descriptions by people who claim to have seen it. 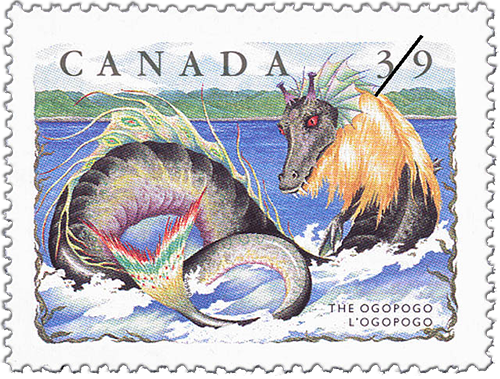 The legend is such a large part of British Columbian folklore that the Canadian Government even issued an "Ogopogo" postal stamp in the 1990's, reflecting one artist's idea of what Ogopogo may look like, as described during many reported sightings up until that time. Because of the sheer number of reported sightings in various parts of Lake Okanagan, a great many people believe that something does indeed exist, with the general consensus being that it is possibly a species that has survived due to the depth of Lake Okanagan and its cooler temperatures. Seasonally cooler temperatures and decreased boat activity in the Fall could also explain the fact that the majority of reported sightings seems to be between late August and early October. 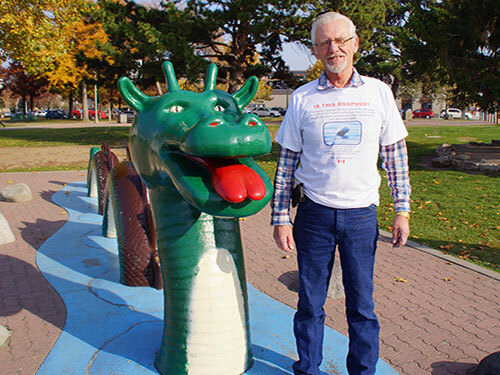 Kelowna resident Bill Steciuk has been hoping to prove the existence of Ogopogo every since he is certain that he first saw the elusive Lake Okanagan legend in October of 1978. 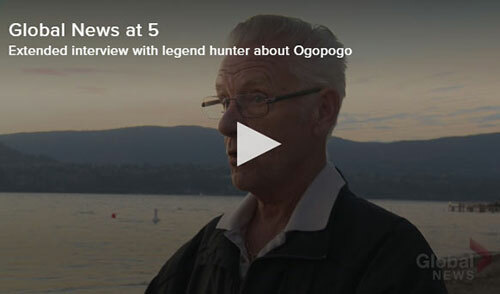 He and a group of believers dubbed themselves"Legend Hunters", and they set out to prove scientifically that Ogopogo does exist. 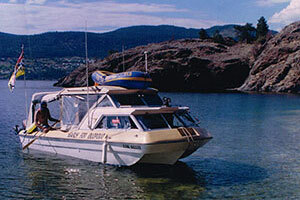 Read about their fascinating expeditions held in the early 2000's. The story of the recent sightings have captured the attention of media around the world, and there have now been stories about our recent local "Ogopogo Sightings" by publications in Australia, in the United Kingdom, as well as Fox News in New York. In 2015, Bill was once again treated to an incredible sight while he was sitting on the balcony of his 4th floor Kelowna condo overlooking Lake Okanagan on a warm sunny May evening in 2015. As he was gazing at the lake, something that appeared to be a head popped up about 150 meters away, right in front of him! Grabbing the camera he had nearby, he shot 4 consecutive pictures of the apparition - it stayed in the same location for over a minute and a half before disappearing under the water. This series of 4 photos are simply incredible but IT IS NOT A HOAX!!! Bill Steciuk has the original photos from his camera, and can show them to anyone who doesn't believe that these pictures are real! These images were taken on the evening of May 24, 2015, while Bill was sitting on the balcony of his 4th floor Kelowna condo, facing Lake Okanagan. He guessed that the "subject" was approximately 150 meters away. The following 4 photos were taken consecutively, and there is no other explanation for what he saw - this must be Ogopogo checking out its surroundings! Although the final larger image of the "head" is quite blurry, the sequence of images clearly indicates a head moving above the water. 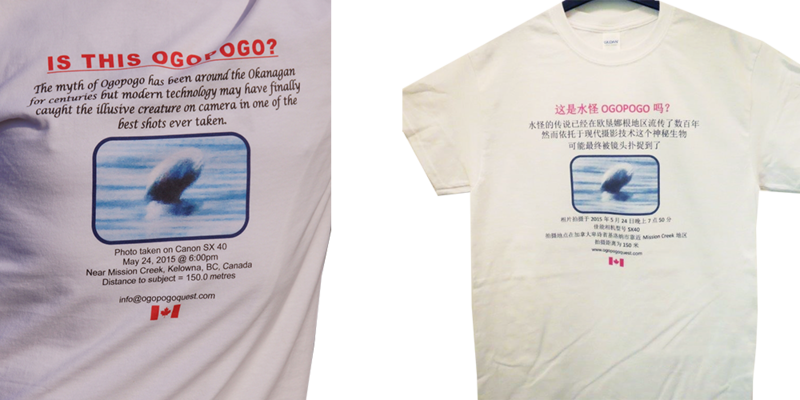 We have created special "Ogopogo" t-shirts showing the exact time and photo specs when pictures were taken in 2015 of what certainly appears to be the elusive Okanagan Lake resident. They are available in both adult and children sizes - we offer these size choices in both English and in Mandarin. Help Bill Steciuk defray a portion of the costs of maintaining this website and impress your friends at the same time! Buy a T-Shirt for yourself or as a great gift for someone! Is this the elusive Ogopogo roaming the waters of Lake Okanagan? Bill has decided to share this fabulous photo with you! Be among the first to sport a "genuine Ogopogo shirt" featuring a slightly blurry picture that certainly leaves it up to your imagination as to what or "who" is the subject of the photo! Click here to buy one of our exclusive designs! 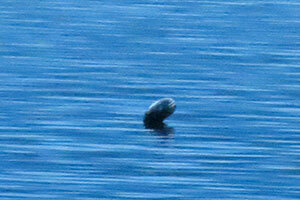 Do you have a story to share about a sighting of the creature inhabiting Lake Okanagan? Click here to fill out a form to report it to us. Can you help Bill maintain this website through a small contribution?